Construct, erect, and check regularly at least two artificial nest boxes (wood duck, bluebird, squirrel, etc.) and keep written records for one nesting season. Construct, erect, and check regularly bird feeders and keep written records of the kinds of birds visiting the feeders. Design Develop and implement a fishery improvement project or a backyard wildlife habitat improvement project and report . Share the results with your counselor. Design and construct a wildlife blind near a game trail, water hole, salt lick, bird feeder, or birdbath and take good photographs or make sketches from the blind of any combination of 10 wild birds, mammals, reptiles, or amphibians. Observe and record 25 species of wildlife. Your list may include mammals, birds, reptiles, amphibians, and fish. Write down when and where each animal was seen. List the wildlife species in your state that are classified as endangered, threatened, exotic, non-native, game species, furbearers, or migratory game birds. Discuss with your counselor management practices in place or being developed for at least three of these species. Start a scrapbook of North American fish and wildlife. Insert markers to divide the book into separate parts for mammals, birds, reptiles, amphibians, and fish. Collect articles on such subjects as life histories, habitat, behavior, and feeding habits on all of the five categories and place them in your notebook accordingly. Articles and pictures may be taken from newspapers or science, nature and outdoor magazines; , or from other sources including the Internet (with your parent's permission). Enter at least five articles on mammals, five on birds, five on reptiles, five on amphibians, and five on fish. Put each animal on a separate sheet in alphabetical order. Include pictures whenever possible. Determine the age of five species of fish from scale samples or identify various age classes of one species in a lake and report the results. Conduct a creel census on a small lake to estimate catch per unit effort. Examine the stomach contents of three species of fish and record the findings. It is not necessary to catch any fish for this option. You must (may) visit a cleaning station set up for fishermen or find another, similar alternative. Make a freshwater aquarium. Include at least four species of native plants and four species of animal life, such as whirligig beetles, freshwater shrimp, tadpoles, water snails, and golden shiners. After 60 days or observation, discuss with your counselor the life cycles, food chains, and management needs you have recognized. After completing requirement 7d to your counselor's satisfaction, with your counselor's assistance, check local laws to determine what you should do with the specimens you have collected. 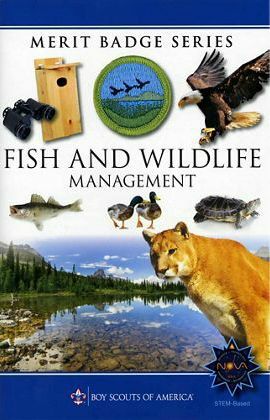 Using resources found at the library and in periodicals, books, and the Internet (with your parent's permission), learn about three different kinds of work done positions held by fish and wildlife managers fisheries and/or wildlife professionals. Find out the education and training requirements for each position. Note: The last sentence of requirement 7c has read "You may visit ..." in the merit badge pamphlet, and "You must visit ..." in Boy Scout Requirements since it was added in 2004.